The article reports, “What is believed to be the biggest cheddar cheese ever manufactured in the United States was removed from its specially constructed steel hoop and paraffined with a whitewash brush at the plant of the Bandon Cheese & Produce Company this week. While its exact weight has not been determined, it is estimated at more than 2,000 pounds. It is the first of ten to be made on special order for San Francisco and Oakland merchants. “Making cheese of such proportions is not within the routine of the average factory,” according to F.M. Bennett, manager of the local plant. A specially designed steel hoop was made by York & Co., Bandon machinists, which is about four feet high, round like an old-fashioned butter tub, about 4 ½ feet in diameter at the bottom. This is placed in a specially built press reinforced with steel rods. “It took approximately 20,000 pounds of milk to make the curds for this cheese. It took 20,000 pounds of pressure to squeeze the whey out of the curds. The pressure was obtained through the use of three large jackscrews, fastened to the top with heavy chains. Instead of cheese cloth being used as a covering it was necessary to use a heavy canvas. 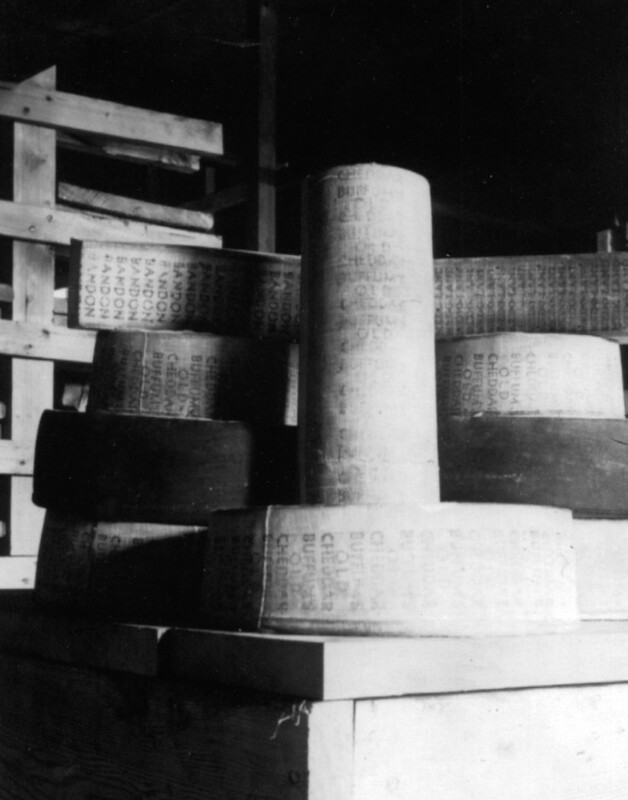 The article backtracks on its claim that the cheese is the biggest made in America, reporting that a 2,800 pound cheese had been presented to President Roosevelt by an eastern cheese maker. A “Western World” article a week later reports the appearance of the big cheese in a parade to celebrate the opening of what has come to be called the McCulloch Bridge in North Bend. “Bandon was represented in the parade by the Bandon Concert Band and a float prepared by the Bandon Cheese & Produce Company which carried the mammoth cheddar cheese made at the local plant. Presumably, the cheese was shipped to California after its appearance in the parade. Whether the cheese factory completed its order for nine more one ton cheeses has not been found, but the factory burned in the September 1936 fire. The factory was rebuilt and reopened in 1937. 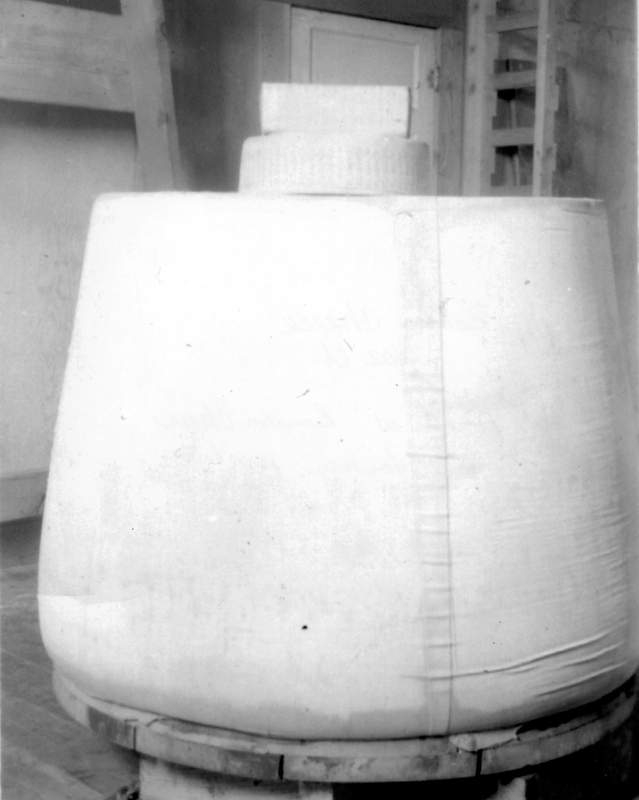 The 1928 cheese was to weigh close to 1000 pounds. Its destination was the food department of a new department store. Customers buying a piece of the cheese were given a chance to guess its weight. 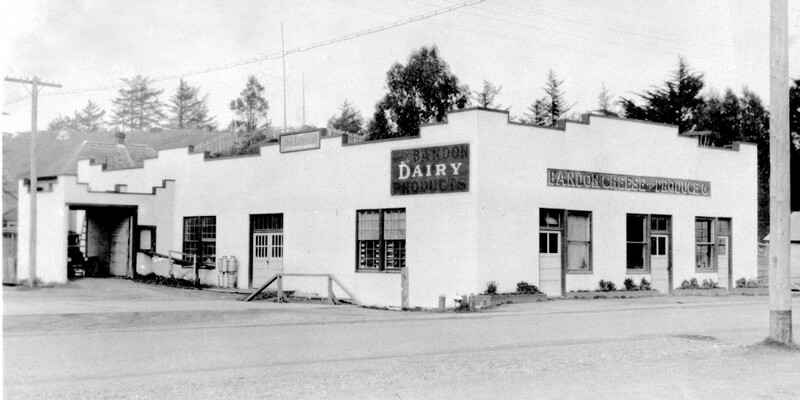 The photos of the Big Cheese of 1936 are a part of the Bandon Historical Society Museum’s display about dairying and cheese making. The Bandon Historical Society Museum is open February through December, 270 Fillmore Ave SE, one block south of Bandon’s present-day cheese factory, Face Rock Creamery.